☀ Unique design with half-moon appearance make it looks more modern, which creates a stylish appearance once installed. ☀ Best choice for decorating, led light can be used to creating a warm, soft, romantic and comfortable ambiance, and ease your mind effectively. ☀ Waterproof, weatherproof, rustproof. Sturdy waterproof design with IP65 protection level can not only protect the led light from rusty but also ensure that you can use it safety. ☀ Can also used in commercial places like shopping malls, square, hotels as decoration or lighting. ☀ Work with 12 volts (low voltage) DC power supply, a very environmentally friendly way of lighting and enhancing your garden, yard, indoor floors, stairs. ★ Voice Control -- Use Amazon Alexa or Google Assistant to control your lights without ever lifting a finger. Simply ask to turn the lights on or off or dim to your desired brightness. Assign a name to each lights set and communicate with each lights set by name when making a voice command. ★ Timer Mode -- Schedule your lights to turn on or off at specific time. Come home to a bright and well lit home. During Vacation make it look like someone's home, even when you're not. 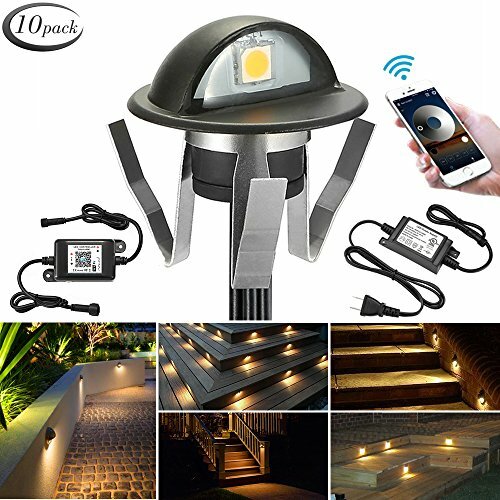 ★ Waterproof -- The deck lights are IP65 and cables are IP67 waterproof and safe for indoor and outdoor use. With cable attached by male and female waterproof connectors. This kind of low voltage LED deck light is made of superb Zinc Alloys/Stainless Steel material so that it is durable. ★ Light Dimension -- Light Size: Φ1.38" x H0.98". Mount Hole Size: 0.94". Cable Length: Double 1.64ft (Per Light). Distance Between Light to Light: 3.28ft. Single color lights are 2pin lights, if you want to extend them, please choose our 2pin extension cables. ★ Remote Control -- Whether home or away, you can always make sure your lighting is set the way you want it. Turn the lights on from your car when you arrive home at night, and make sure all your lights are switched off even when you're already at work. Great outdoor security night light for wall, patio, garden, porch, lawn, pathway, stairway, driveway, etc. If you have any questions about this product by FVTLED, contact us by completing and submitting the form below. If you are looking for a specif part number, please include it with your message.